Where data comes to play. See how Biba gives you the power to transform your playground data into ROI-driven insights, craft better programming, write tighter grant proposals and showcase the best features of your community. Connect with the power of Biba. Biba is the mobile playground app that keeps kids active, parents engaged and playground owners informed with fun games that capture actionable data. Biba is a free-to-play suite of mobile games specifically designed to get kids who are sitting in front of screens active in the real world on local playgrounds. The Biba games are free to play, family friendly and available for download on both Apple and Android devices. Unlock a wealth of vital playground data. Owners of Biba-activated playgrounds will receive regular personalized data reports and insights from the data captured during Biba gameplay. That data can then be used by playground owners and operators to craft better programming, write tighter grant proposals and showcase the best features of their communities. Combine the digital play kids love with the active play and nostalgic fun parents remember. Biba’s imaginative augmented reality games can be played on any playground but work best on those equipped with Biba’s gameplay markers. These markers designate play stations where Biba users can unlock new content, activate mini-games and reveal new treasures, as well as enjoy obstacle courses, treasure hunts, make-believe adventures and team play. Selecting from a series of variables, you can compare your community playgrounds to one another, or to other locations around the state or across the country. The at-a-glance view gives you a quick sense of what’s happening in your community, while online filters allow you to make customized comparisons. When are people using my playground? 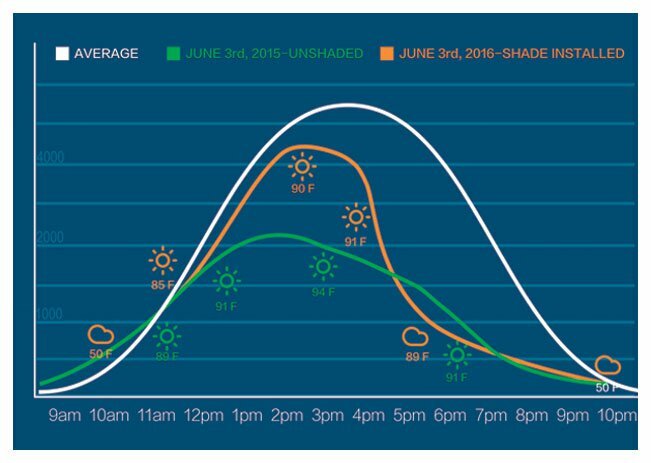 Many factors can impact play, ranging from national holidays to inclement weather to traffic congestion. 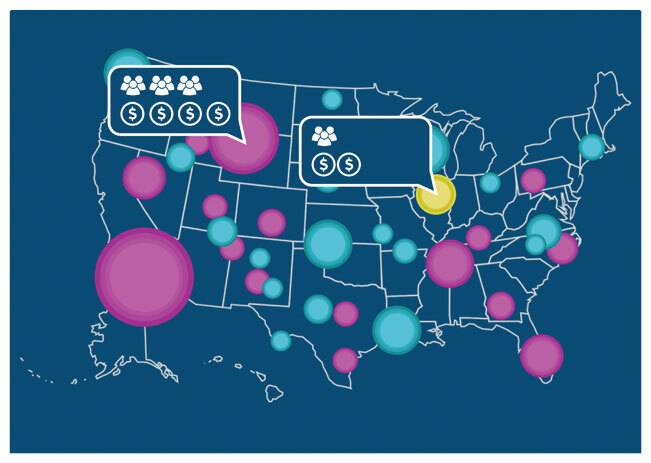 Our data-capture system lets you separate the signal from the noise and get compelling insights into your community. Summer heat slows play in this community, but by adding shade structures, you can keep kids and caregivers comfortable and active. 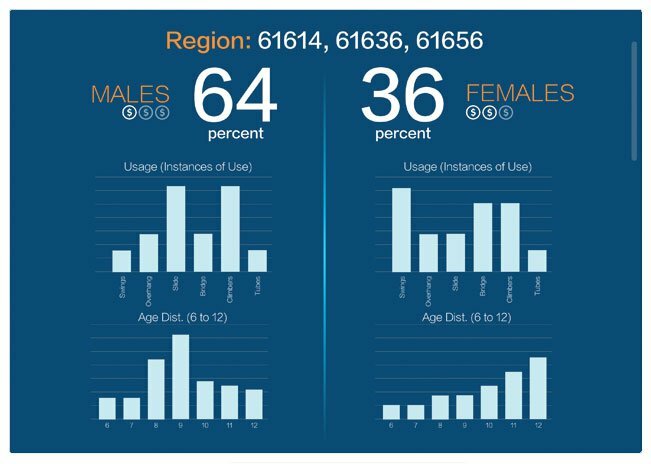 Our data-capture system allows you to perform demographic filtering—by gender,region, socioeconomic status, etc.—which can yield big insights into playground usage habits. There are significantly fewer girls playing in this park, so it may make sense to direct future equipment purchases toward this demographic. *Biba will automatically be included on all qualifying playground orders. A qualifying playground order must meet the following criteria: (a) Playground must have a list price of $25,000 or more, (b) Playground must have posts to which markers can be attached, (c) Playground must be shipped in North America (or Hawaii). Biba will not be included as a standard feature on: (1) Orders less than $25k list, (2) A single item that is $25k list or more, but it is not a complete playground with posts to which the markers can be attached, (3) Fitness equipment / fitness trail only, (4) Site amenities only, (5) Replacement parts or other goods/services that will not be assembled as a complete playground.